Rachel and I didn't just watch movies this Labor Day weekend. 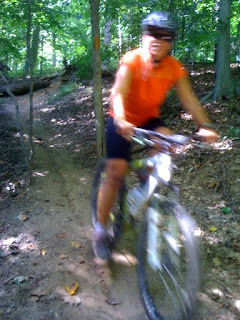 We did some adventurous mountain biking in Patapsco, which is billed as "one of Maryland's first state parks (1907)" and is located just south of BWI airport. Rachel didn't wipe out at all. But me? 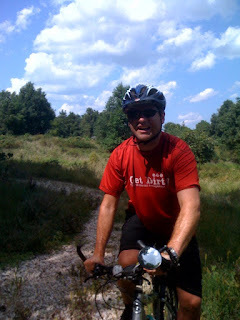 Much like our last mountain-biking expedition, I had one solid wipeout. Hit a tree with my left arm (only minor scrapes to show for it) on a downhill and flew over my handlebars. Luckily, my ride didn't land on me and was halted by another tree, which kept it from going down a steep hill or, uh, mountain. Not really the smartest sport for me to be doing, but it is amazing fun and should be tried by more Americans (I'm always amazed at both the sense of freedom and the lack of riders on the trails). what kind of bike are you riding now?